I recently saw a trailer for Amelia which hits the theaters on October 23. Although I'm not a card-carrying member of the Hilary Swank-y club, I adore the history of Ms. Earhart. 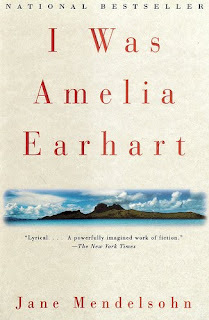 Since I'm always on the hunt for a good sequel, I Was Amelia Earhart by Jane Mendelsohn hit just the spot. This short novel packs quite a punch as it weaves fact and fiction in the "what happened next" after Amelia and her navigator disappeared somewhere over the Pacific Ocean during their attempt to fly around the world. I don't care if it's pretend. I am choosing to believe. I'm going to be straight with you right out of the gate. This may only be hilarious to me. I heart Ricky Gervais. I've already recommended the television show Glee in the RR, but the music deserves a mention in this section as well. I joined my high school choir after dropping Calculus my senior year (already had the college scholarships, so functions were no longer required in my limited perspective.) I wish we had been a show choir. Without the matching outfits. Enjoy this unique and fabulous version of Queen's Somebody to Love. THANK YOU for the Elmo and Ricky Gervais video link!! That is terrific! I L-O-V-E the Ricky Gervais/Elmo bit. I may be a bit biased as I generally tend to love anything Ricky Gervais says/does, but this is hilarious to me too. That video was HILARIOUS! We are HUGE Elmo fans at our house. I don't think Jack would get the video but I had a great time watching it.